The state of Virginia has been inhabited and visited by nature lovers for thousands of years, and was chosen by British colonizers in the 1700s for its vast supply of natural resources and access to ports and waterways. Many of the towns dotted along the Blue Ridge Mountains served as major hubs for colonizers, including the grand city of Roanoke just west of the mountains in southwestern Virginia near the West Virginia border. 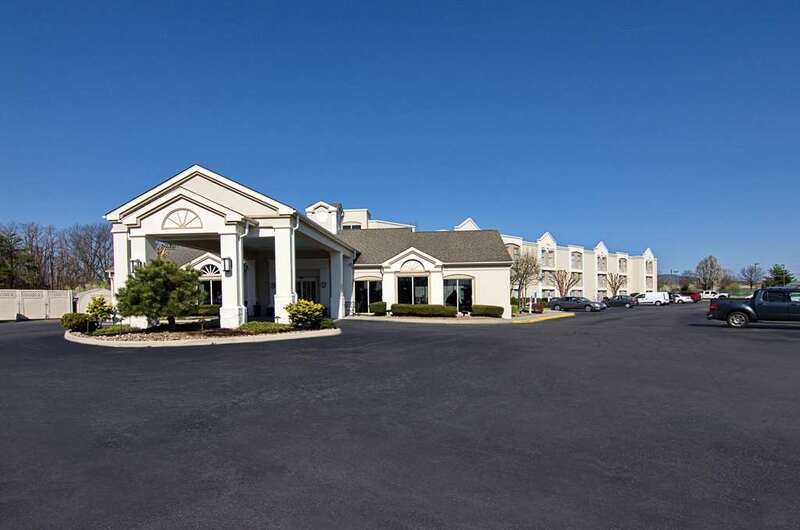 The Best Western Plus Inn at Valley View is situated just off Central Virginia's Interstate 581 in this serene setting, offering guests southern hospitality, unbeatable amenities, and an ideal location - just one mile from the airport. Step inside our property to take in the cozy, charming ambiance and youll find a large, indoor saltwater pool with a pretty, outdoor deck for soaking up some sun. Each of our rooms features vintage styling paired with cozy details like grand window treatments, leather easy chairs, and ottomans, plus modern conveniences like HBO, microwaves, refrigerators, and large vanities. Start your morning right with a visit to our inviting fitness center, and then indulge in deluxe complimentary breakfast featuring Belgian waffles, donuts, fruit, and eggs. Business travelers will appreciate our handy business center, on-site conference room, and grab-and-go breakfast, while road trippers can take advantage of our Motorcycle Rider-Friendly amenities. Whether youre just passing through or staying a while, youll love being within walking distance to dozens of restaurants, including fast casual dining at the Valley View Mall, plus fine seafood and steak restaurants. Logan's Steakhouse: 0.40 mile(s) from Logan's Steakhouse, 11:00 a.m. to 10:00 p.m.
TGI Friday's: 0.10 mile(s) from TGI Friday's, 11:00 a.m. to 2:00 a.m.
Shakers: 0.20 mile(s) from Shakers, 11:00 a.m. to 11:00 p.m.
Applebee's: 0.10 mile(s) from Applebee's, 11:00 a.m. to 11:00 p.m.
Golden Corral: 2.00 mile(s) from Golden Corral, Mon-Fri 10:30 a.m. to 9:00 p.m.; Sat-Sun 7:00 a.m. to 10:00 p.m.
Ruby Tuesday's: 0.40 mile(s) from Ruby Tuesday's, 11:00 a.m. to 11:00 p.m.
Hooters: 2.50 mile(s) from Hooters, Mon-Thur 11:00 a.m. to Midnight; Fri-Sat 11:00 a.m. to 1:00 a.m.
K&W Cafeteria: 2.00 mile(s) from K&W Cafeteria, 6:00 a.m. to 10:00 p.m. Chic Filet: 0.40 mile(s) from Chic Filet, 6:00 a.m. to 10:00 p.m.
Olive Garden: 0.10 mile(s) from Olive Garden, 11:00 a.m. to 10:00 p.m.
Harbor Inn Seafood: 5.00 mile(s) from Harbor Inn Seafood, Tue-Thur 4:00 p.m. to 9:00 p.m.; Fri-Sat 4:00 p.m. to 10:00 p.m.; Sun 11:00 a.m. to 9:00 p.m.
CiCis Pizza: 2.50 mile(s) from CiCis Pizza, 11:00 a.m. to 10:00 p.m.
From: The north. Follow Interstate 81 to Exit 143, then follow Interstate 581 to Exit 3E. Take the first exit marked Shopping Center and The Best Western Plus Inn at Valley View is located on the right. From: The south. Follow Interstate 81 to Exit 143 and Interstate 581 to Exit 3E (Hershberger Road). Take the Shopping Center Exit. The Best Western Plus Inn at Valley View is located at Valley View Boulevard between Hershberger and Interstate 581.